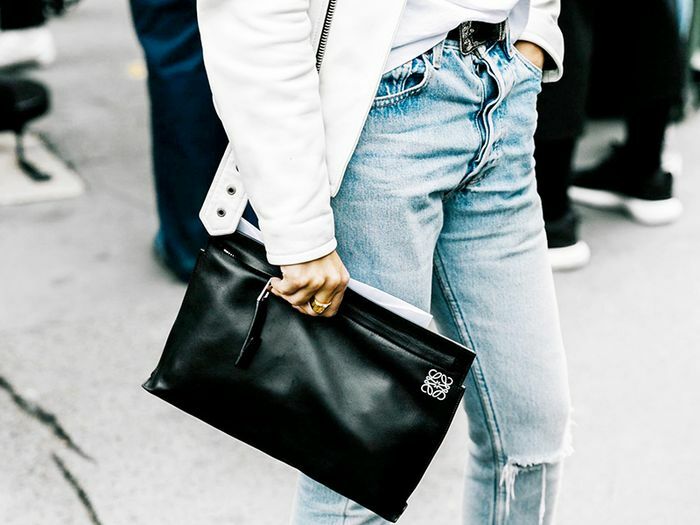 There’s nothing quite like the look of vintage jeans, which is perhaps why every fashion girl we know is perpetually on the hunt for a pair of worn-in Levi 501s. But if you still haven’t found the perfect pair, we’re here to share some tips on how to re-create the look of vintage denim yourself. To find out the very best advice, we went straight to the source and tapped Jill Guenza, the head of women’s design at Levi’s. Ahead, she’s sharing her top tips for making your jeans look vintage, including the best way to re-create frayed hems, natural-looking holes, white patches, and a retro wash. Don’t be surprised if someone asks you which vintage store you found them in. Want to find out how Levi’s pros distress their denim? Keep reading to find out how to make ripped jeans and denim that looks lived-in, straight from the experts at Levi’s. Then, shop our favorite vintage-inspired jeans. For natural-looking frayed hems, cut a slightly jagged line rather than a straight line. Then, open the scissors, and run the sharp edge of one of the scissor arms along the edge of the hem against the grain of the fabric. This will cause the fibers at the hem to loosen and fray. To create holes with some white fringe on the edges, follow the above step to create damaged areas. Then use your fingers to pull the white fibers apart at the center of the damage rather than cut them with scissors. This will create a more natural look. To create damaged areas with the white weft fibers exposed, make a series of horizontal slices close together. Open the scissors, and run the sharp edge of one of the arms along the cuts from left to right against the grain of the fabric. This should loosen some of the fibers. Then pull out all the loose blue bits with your fingers, leaving the white weft fibers running horizontally. After cutting hems or creating holes, throw your jeans in the sink, and agitate them after or toss them in the washing machine for a quick cycle to get the fibers to fray and look more natural. Always start smaller in the damaged areas/holes and longer in the hem cuts than you want the end result. The holes and the hems will open and fray more in the wash.
Go on to shop for vintage-inspired jeans. The undeniable It jean of the summer. A staple necessity for your closet. Elevate your distressed jeans with Chanel shoes and a silk blouse. Show off your distressed style with black shoes and a basic top. Match your distressed pants with a band tee for a vintage look. A slight flare at the bottom of denim adds a touch of individuality. Update your old white denim with a distressed pair. Rock these jeans with statement booties. An unfinished hem is an easy way to add detail to your outfit. Light-wash denim jeans can be styled for any season. This high-waisted pair is great for summer. Distress your jeans in multiple areas rather than one focal point. Style your jeans with white shoes. Tired of the routine navy wash? Try a different shade like this light pink. Slits on the knees are an easy placement of distress. Fashion girls live for asymmetrical rips in their denim. Don’t want to expose your skin? No problem, opt for underlying patches instead. Pair these jeans with a black cami for a night out. It girls are styling their high-waisted denim with statement blouses. 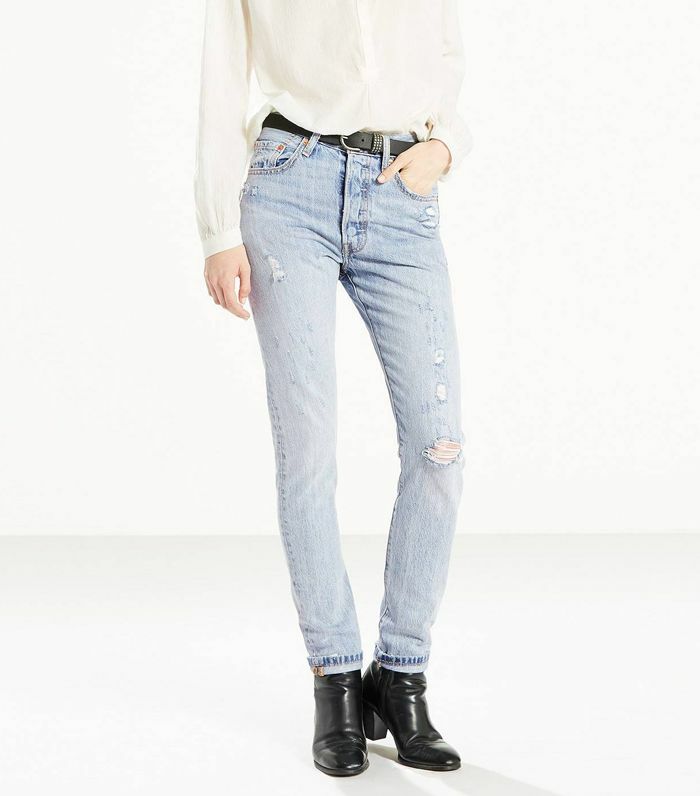 If you are on the more petite side, purchase cropped denim to ensure a shorter inseam. Try on your denim before altering the material to know exactly where you want it to be distressed. Next, read about the jeans French girls would never wear.